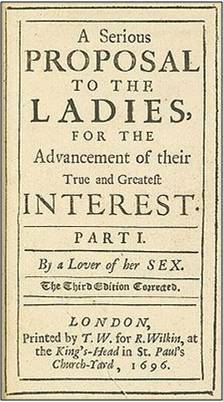 Mary Astell is often called the first English feminist, but her views on women would dismay any modern liberal. She was an unshakeable Tory Anglican who dared to cross swords with the great liberal thinker John Locke. For many admirers it’s not her womanhood at all which requires to be admired: it’s her sheer intellect – she was a brilliant philosopher with a very, very sharp pen. One of two great women writers of her generation to emerge from the obscurity of Newcastle (the other was the first scholar to produce an English- Anglo-Saxon dictionary, Elizabeth Elstob), she lived her adult life in London among a glittering array of thinkers, many of them formidable women who pass muster as an early Enlightenment all of their own. The short-reigning Queen Anne was an inspirational patroness. The religious/political fervour of the period between two civil wars and the Jacobite uprising, during which the British monarchy was in almost permanent crisis, provides a vivid backdrop. 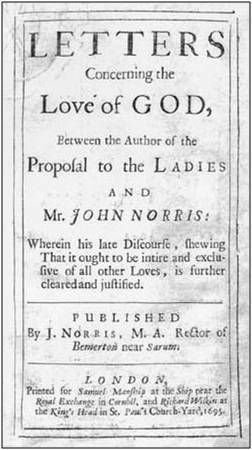 Mary Astell never married. Indeed, she was uninterested in love; logic and rationality were her passions, above all in the fields of religion, constitutional reform and the social contract on which she held startling, penetrating views. She would have got on famously with Christine de Pizan; perhaps also with Celia Fiennes, whom she may have met. She had many male admirers and quite a number of enemies; few of the latter could hold their own against her. Some of her views may now seem rather retrograde; others are expressed with the sort of rhetorical power that cannot be refuted. But as a shining light in London’s early 18th century intelligentsia she deserves a much more prominent place than she has yet been allowed in the line of great British thinkers (and writers about thinking) which runs from Hobbes and Locke through to David Hume, Adam Smith and JS and Harriet Mill. 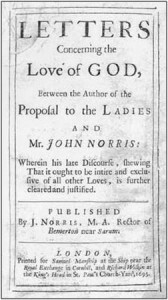 Some Reflections upon Marriage 1700.
Letters Concerning the Love of God. Letter V.
Seeing it is ignorance, either habitual or actual, which is the cause of all Sin, how are they like to escape this, who are bred up in that? That therefore women are unprofitable to most, and a plague and dishonour to some Men is not much to be regretted on account of the Men, because ’tis the product of their own folly, in denying them the benefits of an ingenuous and liberal Education. To be yok’d for Life to a disagreeable Person and Temper; to have Folly and Ignorance tyrannize over Wit and Sense; to be contradicted in every thing one does or says, and bore down not by Reason but Authority; to be denied one’s most innocent desires, for no other cause but the Will and Pleasure of an absolute Lord and Master, whose Follies a Woman with all her Prudence cannot hide, and whose Commands she cannot but despise at the same time she obeys them; is a misery none can have a just Idea of, but those who have felt it. If none were to Marry, but Men of strict Vertue and Honour, I doubt the World would be but thinly peopled. If a Woman can neither Love nor Honour, she does ill in promising to Obey. 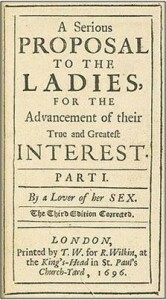 The short is; The true and the principal Cause of that Great Rebellion, and that Horrid fact which compleated it, and which we can never enough deplore, was this: Some Cunning and Self-ended Men, whose Wickedness was equal to their Craft, and their Craft sufficient to carry them thro’ their Wickedness; these had Thoughts and Meanings to destroy the Government in Church and State, and to set up a Model of their own Invention, agreeable to their own private Interests and Designs, under the specious Pretences of the Peoples Rights and Liberties. They did not indeed speak out, and declare this at first, for that wou’d have spoil’d the Intrigue, every body wou’d have abhorr’d them; but a little Discernment might have found what they drove at. For to lessen and incroach upon the Royal Authority, is the only way to null it by degrees, as an ingenious Person observes upon this Occasion. 1700 Astell: Some Reflections on Marriage.